Russia’s leading truck maker is going to use its own funds as well as loans to purchase equipment for its assembly lines to launch production of a new vehicle and Daimler cabins and axles, Vedomosti daily reported Thursday. The Daimler products will require $200mn investment each. The truck producer also plans to invest in a JV with Cummins Inc to produce engines and in a JV with Zahnrad Fabrik which makes transmissions, according to Sergey Kogogin, the Kamaz chief. He stressed that Kamaz is bringing its new product line into the premium class that will boast a longer operational lifetime, high energy efficiency and longer warranty. “Customers in Russia and abroad become more interested in vehicles of premium class,” Kogogin said. However, the truck maker doesn’t plan to give up current production. “It’s a question of market environment and consumer perception. We don’t know, if the customers would be ready to pay 20% more,” Kogogin explained. Earlier this month Kamaz announced a $600mln project to equip their assembly lines with robots which will use lasers to correct flaws in truck parts. The lasers will be supplied IRE-Polus, based near Moscow, and robotic software developers Eidos, based in Kazan, in Russia’s Republic of Tatarstan. Experts say Kamaz would be the world first truck maker to introduce this kind of technology to assemble trucks, though it has been already used to produce vehicles such as Mercedes and Audi. Kamaz, based in Tatarstan, currently has a more than 30% of the Russian market and is considered No.11 among world largest truck producers with exports to 80 countries. 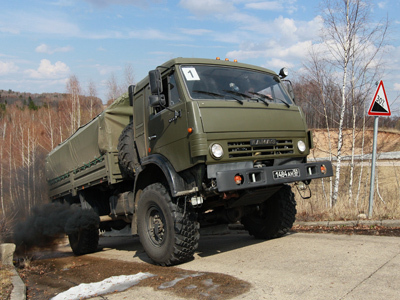 Kamaz is also a leading truck supplier in Kazakhstan, Ukraine and Turkmenistan. 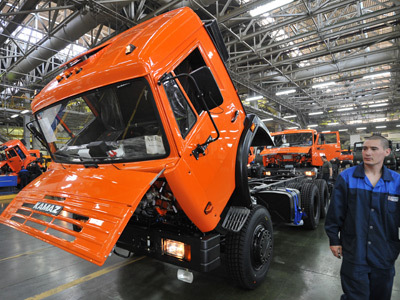 The firm produced more than 47,500 trucks by December 2012 with 36,000 for the domestic market. Kamaz-Master team driver Eduard Nikolayev competes in the 4th round of the Silk Way Rally (RIA Novosti / Egor Aleev) Kamaz-Master crew became winner of "Dakar" (formerly "Paris – Dakar") rally 10 times.